Electrical characterization of materials evolved in three levels of understanding. In the early 1800s, the resistance R and conductance G were treated as measurable physical quantities obtainable from two-terminal I-V measurements (i.e., current I, voltage V). Later, it became obvious that the resistance alone was not comprehensive enough since different sample shapes gave different resistance values. This led to the understanding (second level) that an intrinsic material property like resistivity (or conductivity) is required that is not influenced by the particular geometry of the sample. For the first time, this allowed scientists to quantify the current-carrying capability of the material and carry out meaningful comparisons between different samples. Theories of electrical conduction were constructed with varying degrees of success, but until the advent of quantum mechanics, no generally acceptable solution to the problem of electrical transport was developed. This led to the definitions of carrier density n and mobility µ (third level of understanding) which are capable of dealing with even the most complex electrical measurements today. 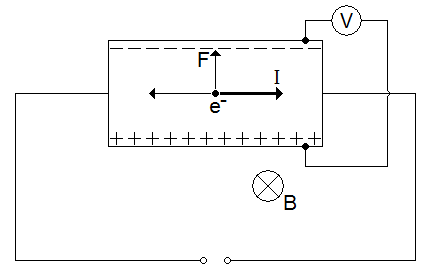 Figure 1: Illustration of the Hall effect in a bar of conducting material. If the conducting layer thickness d is known, one can determine the bulk resistivity (r = RSd) and the bulk density (n = nS/d). In order to determine both the mobility µ and the sheet density ns, a combination of a resistivity measurement and a Hall measurement is needed. We discuss here the Van der Pauw technique which, due to its convenience, is widely used in the semiconductor industry to determine the resistivity of uniform samples (References 3 and 4). As originally devised by Van der Pauw, one uses an arbitrarily shaped (but simply connected, i.e. no holes or nonconducting islands or inclusions), thin-plate sample containing four very small ohmic contacts placed on the periphery (preferably in the corners) of the plate. Examples of Van der Pauw configurations are shown in figure 2. "Standard Test Methods for Measuring Resistivity and Hall Coefficient and Determining Hall Mobility in Single-Crystal Semiconductors," ASTM Designation F76, Annual Book of ASTM Standards, Vol. 10.05 (2000). E. H. Hall, "On a New Action of the Magnet on Electrical Current," Amer. J. Math. 2, 287-292 (1879). L. J. van der Pauw, "A Method of Measuring Specific Resistivity and Hall Effect of Discs of Arbitrary Shapes," Philips Res. Repts. 13, 1-9 (1958). L. J. van der Pauw, "A Method of Measuring the Resistivity and Hall Coefficient on Lamellae of Arbitrary Shape," Philips Tech. Rev. 20, 220-224 (1958). E. H. Putley, The Hall Effect and Related Phenomena, Butterworths, London (1960). D. C. Look, Electrical Characterization of GaAs Materials and Devices, John Wiley & Sons, Chichester (1989). D. K. Schroder, Semiconductor Material and Device Characterization, 2nd Edition, John Wiley & Sons, New York (1998). R. Chwang, B. J. Smith and C. R. Crowell, "Contact Size Effects on the van der Pauw Method for Resistivity and Hall Coefficient Measurement," Solid-State Electronics 17, 1217-1227 (1974). D. L. Rode, C. M. Wolfe and G. E. Stillman, "Magnetic-Field Dependence of the Hall Factor for Isotropic Media," J. Appl. Phys. 54, 10-13 (1983). D. L. Rode, "Low-Field Electron Transport," Semiconductors & Semimetals 10, 1-89 (1975).